In our special, coddled cars, the treatment or appearance of the dashboard and instrument panel becomes one of the prime focal points of the interior scheme. Though digital readouts are here, by and large our community prefers the visceral drama of analog needles sweeping past familiar numbers, stuff ingrained since early childhood. Until recently, we’d have to mount the tachometer in one spot and the ancillary meters in another. Then some bright bulb figured he could put all the dials in front of you-stable, easy to read numbers-and maybe a shift light to keep you honest. Case in point: John Morrell’s carbureted 427ci LS-powered ’80 Malibu. Although a dedicated radial tire racer, it’s licensed and insured to be driven on Florida public roads, but rarely turns a tire anywhere except Sunshine Dragway. This conversion was completed at John’s RMP Auto in New Port Richey. Right off, you’ll notice the Auto Meter rev counter and a spray of gauges depending from the dashboard. Nothing wrong with that, but John wanted the engine vitals right there in front of him, hence the Classic Dashes backdrop. The Classic panel is precision-hewn from ABS plastic sheets that are vacuum-formed at 320 degrees F. Accuracy is the key feature. 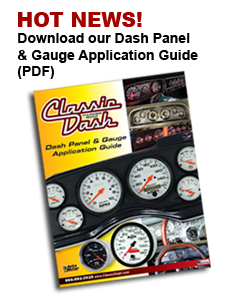 A Thermwood five-axis CNC high-speed router consistently trims the dash panels to within 0.005-inch, plus or minus, and the material is impregnated with a UV inhibitor to combat those nasty rays. Choices include pure black, a carbon fiber pattern, and brushed aluminum, with or without instruments, and with or without holes for the receptacles. Experienced thinkers and fabricators John and fellow racer Justin Brayman spent 12 hours making these changes, but say that the changeover (instructions are voluminous) in a completely stock vehicle would have taken less. They checked their work several times and used the directions as a guide whenever they hit a snag. They also recovered the severely heat-checked dash padding with a new veneer. John bought the new shift light separately.